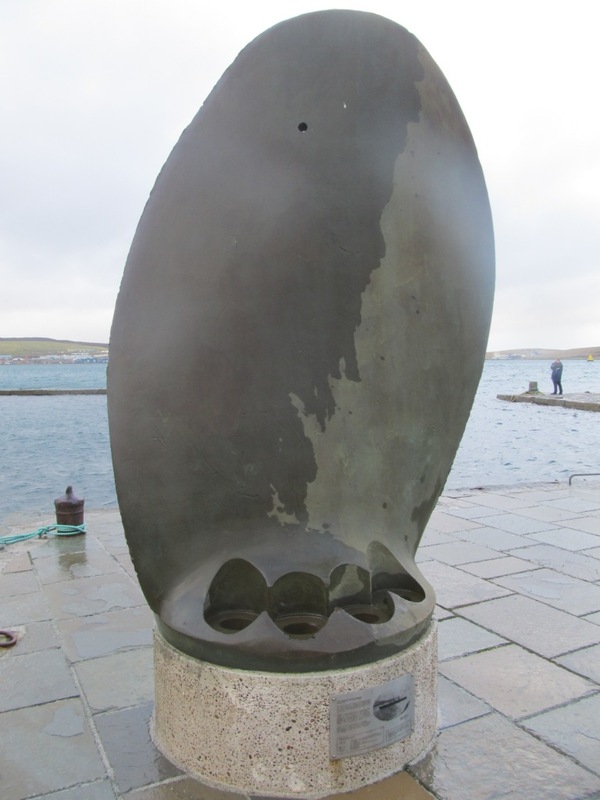 Shetland has less naval heritage than Orkney, but it still has a substantial amount. During the 17th century, the islands were of vital economic importance – but to the Dutch, not the British. Vast Dutch herring fleets regularly sheltered at Bressay Sound, trading with the local people and contributing to the rise of Lerwick at the expense of the old capital, Scalloway. This caused some tension; in 1625 the authorities attempted to stamp out ‘the manifold adultrie and furnicatioun with women venteris of beir and utheris women evill inclined’. In 1703 the French attacked the Dutch herring fleet, destroying the escorting warship Wolfswinkel and pursuing the herring busses into Bressay Sound, where over 150 of them were burned. The islands were also a port of call for Dutch ships outward bound for, or returning from, the East Indies, especially at times of tension or war with Spain, France or England, when the Channel route became problematic. In 1640 three returning East Indiamen and an escorting warship were attacked in Bressay Sound by ten Spanish warships. 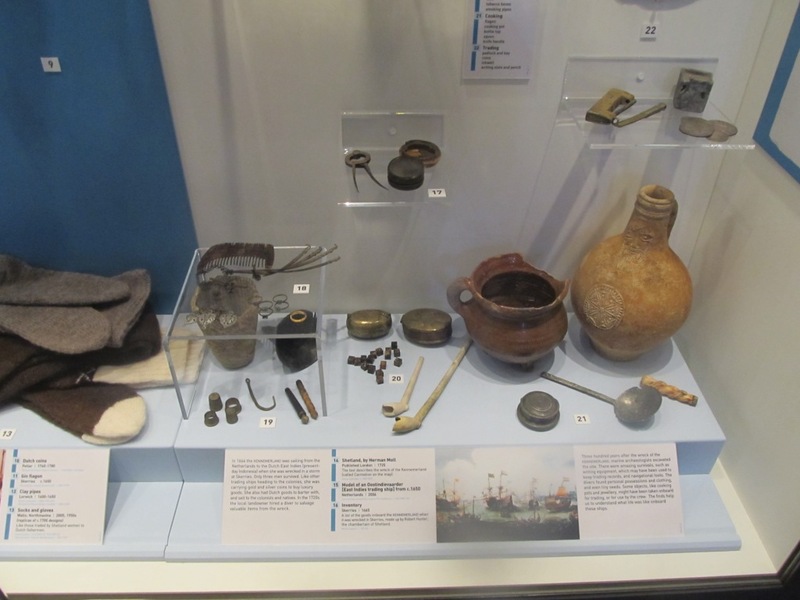 Another such ship, the Kennemerland, was wrecked on the Skerries in 1664, and a number of artefacts from her are displayed at Lerwick Museum. In the summer of 1652, General-at-Sea Robert Blake was ordered to Shetland with a fleet of over eighty ships to intercept the Dutch East India fleet, bound for home ‘north about’ (achteroom) around Scotland. Admiral Tromp went after him, but both fleets were caught in a storm on 25–27 July. Blake and his fleet managed to shelter in Bressay Sound, but the Dutch were battered on a hostile lee shore. After three days of continuous gales Tromp he had only thirty-four ships in company out of a fleet of over 100. Most of the others found some sort of shelter away from the main settlements but six foundered at sea and ten were wrecked. Even so, seven of the nine East Indiamen successfully made it home. 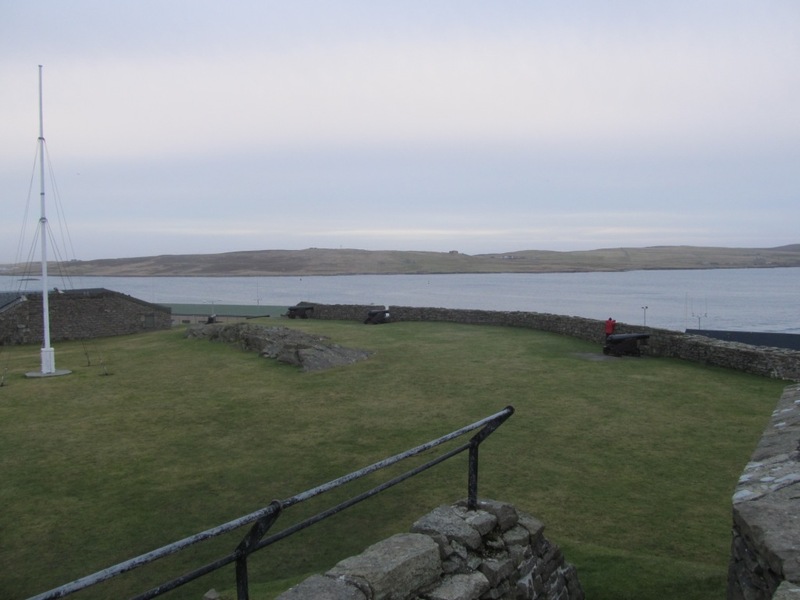 To deny Bressay to the Dutch, a fort was ordered to be built at Lerwick during the first Dutch War (1652-4), but it is not known if this was ever completed. In 1665 work began on a more permanent fortification, built by Charles II’s master builder Robert Mylne. Finished in 1667, this was destroyed by the Dutch in 1673. The depredations of French and American privateers led to its rebuilding in 1781, when it was renamed Fort Charlotte, and it is in this form that it still survives, albeit now hemmed on almost all sides by the buildings of the town. It was used as a Royal Naval Reserve headquarters from 1861 to 1910. Other relics of naval heritage can be found throughout Shetland, although we didn’t have time to investigate any of these in person. During World War I, the navy used the Swarbacks Minn anchorage on the Isle of Vementry as a base for patrols by the 10th Cruiser Squadron; the 6-inch guns of the coastal defence battery erected to protect it are still in situ. Bressay Sound was an important convoy anchorage, and guns were placed at both ends of it. A Royal Naval Air Station was established at Catfirth, operating seaplanes which hunted U-boats in the Atlantic. During World War II, a RN radar station was built on Sumburgh Head to detect U-boats passing between the Atlantic and North Sea via the Fair Isle channel; in 1940, the station provided early warning of a Luftwaffe attempt to bomb the British fleet in Scapa Flow on Orkney. To defend Lerwick, a large new gun battery was erected at Ness of Sound. We did go to Lerwick Museum, which contains very little of naval relevance (other than a propellor blade from HMS Oceanic, the liner turned auxiliary cruiser wrecked on Foula on 8 September 1914), but that certainly isn’t true of the brand new museum at Scalloway, opened only last summer (it doesn’t usually open in winter, but did so for the holiday following Up Helly Aa in Lerwick). Standing in the shadow of brooding Scalloway Castle, another testament to the ambition and extravagance of Patrick, Earl of Orkney – see previous posts in this series – the museum has an interesting display about the sinking of Oceanic. 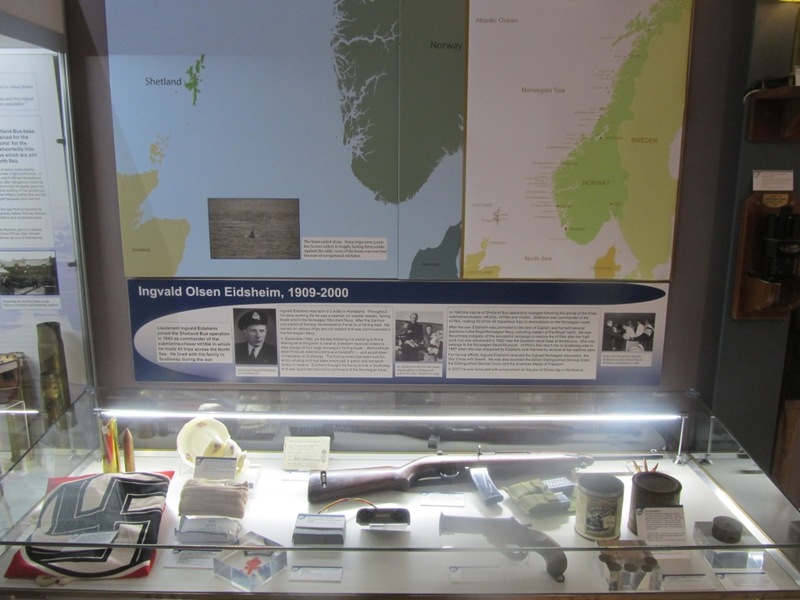 Above all, though, it devotes a substantial amount of its space to the story of the ‘Shetland bus’, the extraordinary covert operation of World War II which saw fishing craft and, later, submarine chasers of the Royal Norwegian Navy smuggling men, equipment and information into or out of their occupied country. It’s an interesting sign of Shetland’s abiding and powerful connection to Norway, which ruled the islands until 1469, that Lerwick Museum was opened by the Queen of Norway and Scalloway’s by its Prime Minister, Jens Stoltenberg; indeed, the latter apparently generated some controversy in his homeland by choosing to spend its national day last year in Scalloway rather than Norway, but by doing so, he emphasised the debt his country owes to the heroes who operated the ‘Shetland Bus’.